I am so glad you have stopped by my web site. I would love for you to browse around, look at some of my quilts and see the workshops and lectures I have to offer. 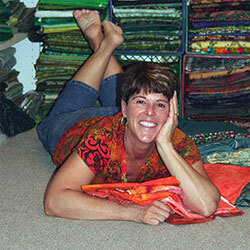 My husband, Joe, says I am so passionate about my quilting and he is correct. I love to quilt. I am also passionate about teaching. I enjoy sharing what I have learned with others. I consider myself very lucky that my quilts have won awards and have been shown on the covers of magazines, including Quilter's Newsletter Magazine. I recently read a wonderful quote from Oprah. "Luck is preparation meeting opportunity. If you hadn't been prepared when the opportunity came along, you wouldn't have been lucky." So even though I have been very lucky along my journey some if it is because I have worked very hard to improve with each and every quilt I make. I hope you enjoy your journey looking through my web site and will feel free to contact me if you should have any questions. This is my first pair of straight blade scissors. They are great for cutting templates (freezer paper, Templar), fabric and fabric with fusible stabilizers. The blades are stainless steel. 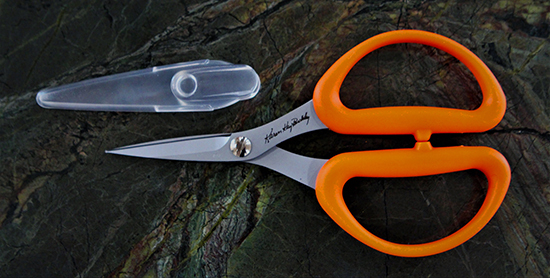 The handles have the same soft, ergonomic grip as our other Perfect Scissors™. They cut sharp to the point and come with a plastic protective cover. Great for both right and left hand cutting. This is a long-awaited product. I have wanted it for myself and have had many requests for this product. 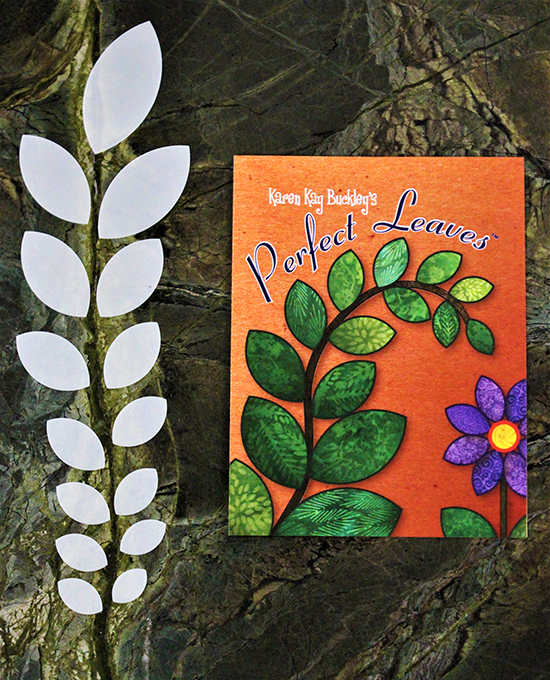 Finally, they are here…….the Perfect Leaves™. Inside each package there are 15 different sizes of leaves (the smallest being 3/5 by 2/5 of an inch and the largest 2 1/5 by 1 1/5 inches). They are made from the same heat resistant plastic as our Perfect Circles®. The paper insert opens to provide detailed written and visual instructions. To view a video, click on "Free Tutorials" on the website. This ingenious ruler is four rulers in one package. The five piece ruler easily snaps together to form a 6 inch, 12 inch, 18 inch or 24 inch length depending on your needs. It has clear and accurate grid markings along with 30, 45 and 60 degree markings. 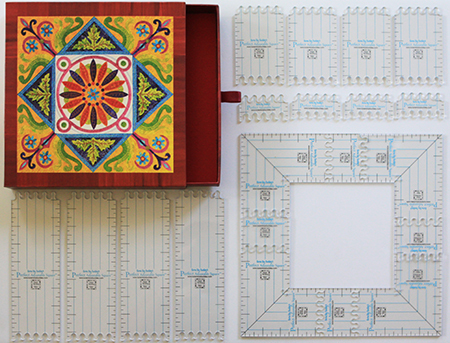 This ruler will become your perfect travel campion as it stores easily in a handy felt bag. It is great when you are at home or on the go. The is a 3"wide version and a 6" wide version. I have been working on an idea for a couple of years. One of my most feared steps, related to applique, is when I have to square the block after I have finished my applique. I, like many other appliquers, prefer to cut our background fabric larger and then square the block to size when the applique is complete. The reason I have always hesitated at this step is....what if I do it incorrrectly and have to make the block over again? With the Karen Kay Buckley's Perfect Adjustable Square™ the fear is removed. In your beautiful decorative storage box you receive: 4 corner units, 4 one inch, 4 two inch, 4 four inch and four eight inch pieces. 20 pieces in all. These pieces snap together similar to a puzzle piece. It will allow you to build a square from 4", the inside of the square is in whole numbers, and up to a 24 1/2" square, the outside is in 1/2" increments. You can easily use your rotary cutter along the outside of the Perfect Adjustable Square™. Also, included in the box is the Perfect Adapter(TM). The recommended retail price is $74.95. Karen Kay Buckley's Perfect Thread Bags™. I love this thread bag because it keeps me so well organized. This fabric bag will hold many different brands of threads. I use it to hold all of my hand applique threads. All the bags are designed the same on the inside but when you go to the "thread bag" section in the "store" you will be able to select a fabric for the exterior of the bag. To find out more visit "free tutorials" page on the website. The feedback on the micro-serrated blade is fantastic. click the start button to learn about my DVD!